Junk phone calls began to annoy Bernard Du Feu. In principle, he didn’t begrudge salespeople trying to sell him products. He had just retired, however, and didn’t want interruptions to his privacy and routine. Bernard endured such calls for a long time. Then the number of calls grew, and he decided to do something about them. “I understand that in this day and age, people have a right to make a living as best they can. But these constant sales calls were invading my privacy. “As I said to my wife, I didn’t retire simply to answer the phone to tenacious salespeople. Or worse, answer the phone and listen to some recorded message. " “Don’t misunderstand me, though. I wasn’t rude to the salespeople who called. I knew from my days at work that you should remain calm and polite on the phone at all times. “The trouble is, I was too polite. A lot of salespeople take this as a chance to push on with their promotion, no matter how many times you say you’re not interested. Some even become offensive after you show you can be as persistent in your refusal to buy a product as they are in selling it. “My son suggested that I should be more forceful and take control of the conversations. This was good advice and certainly worked. By interrupting the callers, firmly telling them I wasn’t interested, wishing them goodbye, and then putting the phone down, I cut the time I spent on each call. But the quantity of junk phone calls continued. " “I therefore rang the customer service centre of my phone provider. The person I spoke to was sympathetic but couldn’t do much to help me. But he did connect me to a department that dealt with ‘anonymous caller rejection’. “As I found out, anonymous caller rejection deals with those callers who withhold their number. I’d come across a good few of these. When I can’t reach the phone in time, and I dial 1471, I often listen to a message telling me the caller withheld the number. “For a small fee, added to my phone bill, the phone provider said I could have anonymous caller rejection. So when a caller with a withheld number tries to contact me, he or she gets a message. This says I won’t accept withheld number calls. “I wasn’t sure this would work, but I subscribed to the scheme. Afterwards, the number of unwanted calls did reduce, but they didn’t go away altogether. “I knew if I was to have peace of mind, I’d have to take further action. 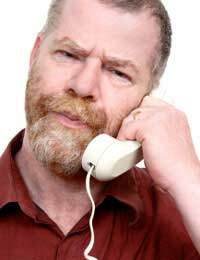 “I did some research on the Internet and came across the Telephone Preference Service (TPS). Apparently, legislation introduced in 1999, and updated in 2003, gives us the right not to have junk phone calls. All you have to do is register your wish not to receive them. “Needless to say, I registered online immediately. This meant that firms could not make unwanted calls to me any more – as a matter of law. “The registration didn’t take effect for 28 days, but I knew I could wait that long. And sure enough, after 28 days, the number of junk phone calls dropped dramatically. “The unwanted calls haven’t stopped completely, but to be honest I never thought they would. But now I get just one or two a week, and I can handle that. "